Dental fun facts and information for your amusement and entertainment. We all should change our toothbrushes every three months or risk potentially severe oral health problems – that’s the message from British Dental Health Foundation ( BDHF). The BDHF has urged more people to start investing in new toothbrushes more regulary, before it develops into a “breeding ground” for germs and bacteria. 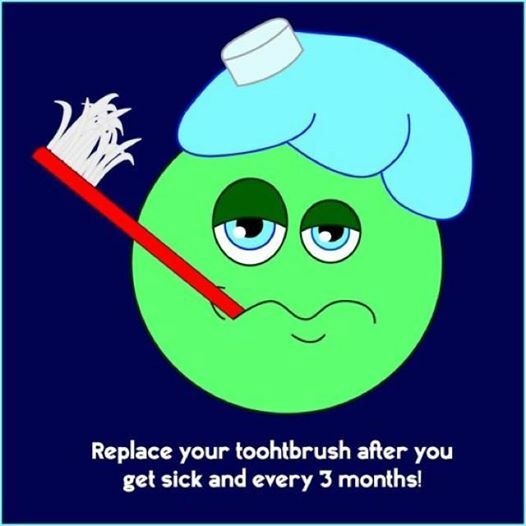 The strongest argument to change your toothbrush regularly is to prevent re-infection following the flu or a cold. A dirty toothbrush can also be responsible for many ear, nose and throat infections. Another survey conducted by the Foundation as part of the nationwide oral health campaign showed that almost two-thirds of Britons would be happy to lend their toothbrush to their partners, children, friends and even celebrities. Sharing a toothbrush leaves people susceptible to all sorts of oral and general health problems. But even if you don’t let anyone else use your brush, you still need to replace it every three months to make sure germs don’t build up, and to keep your brushing as effective as possible. This entry was posted in Did You Know, Fun Facts on 22 June 2011 by Dr Nishan Dixit. Chocolate has topped the poll for the big thing that makes most people smile. The British Dental Health Foundation has been asking hundreds of people what makes them smile the most. In a close fought competition a simple bar of chocolate has topped the poll, followed by “seeing a loved one”. Around half of respondents featured chocolate on their list of items, with 60 per cent of women making it their favourite choice. Men preferred a Sunday roast to chocolate, but both scored highly. The contagious nature of smiling was also highlighted by around a third of people saying they smiled when they “saw someone else smile”. The Foundation also asked people to choose a colour which made them smile the most. The top polling answer was the nice summery colour yellow with around a third of votes. This entry was posted in Dentistry, Did You Know, Fun Facts on 22 June 2011 by Dr Nishan Dixit. Did you know that nineteenth century false teeth were so prone to falling out while eating that many Victorians ate in their bedrooms before dinner to avoid potential embarrassment! This entry was posted in Fun Facts on 22 December 2010 by Dr Nishan Dixit. This entry was posted in Did You Know, Fun Facts on 10 September 2010 by Dr Nishan Dixit.